It's time for the final ceremony of the River Heights Celebration, where four candiates are going for the Mahoney Scholarhip. All four are equally qualified--and equally worthy suspects behind the strange occurances that have been happening at the carnival. Arson, theft and threatening notes all combine to provide a stunning conclusion to the Sabotage Mystery Trilogy. 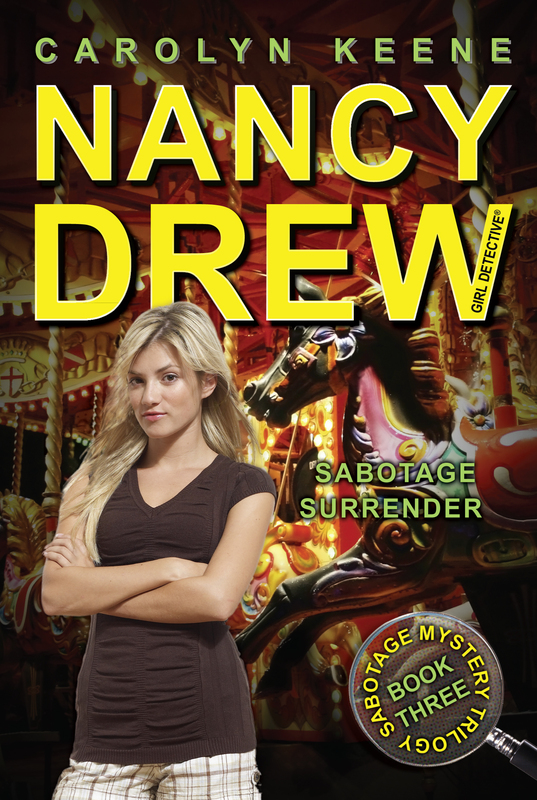 Can Nancy finally figure out the saboteur--before it's too late? I clutched my oversize paper Club Coffee cup and swished the cold, sugary dregs of caffeine around. I took a sip and winced at what had once been a delicious drink. Earlier this morning it had been an extra-large caramel macchiato with extra caramel drizzled over the extra whipped cream with an extra shot of espresso. Earlier this morning it had been amazing and warm and delicious. Sadly, now the coffee was cold and bitter and no longer a priority for me after an hour of sitting in the front office of the school, watching the video footage of the thief over and over. My only hope was that Bess or George would remember to bring me another caramel macchiato when they arrived later. Fingers crossed! To make sure, I pulled out my PDA and sent them each a text as a reminder. As for the thief, I’d watched the video footage, endlessly, on repeat—but I still couldn’t make out much about the actual thief. I had been poring over every inch of the screen. It was a somewhat shorter man dressed all in black, and that was about all I could see. Whoever he was he’d stolen the cash box full of carnival ticket money and gone to great lengths to make sure he couldn’t be identified by covering his tracks, casting blame onto others who happened to be in the area, and concealing any of his identifiable features such as hair color. A real professional, if you asked me. The creepiest detail of all was that he seemed to know where the cameras were stationed around the school and therefore strategically kept to the shadows and out of their line of sight. Once in possession of the cash box, the thief had left the ticket booth and then immediately disappeared. This knowledge of the cameras’ location indicated a certain familiarity with the school. But how so? Was he a teacher? A current student? A former student? An administrator? A member of the janitorial staff? He had done an expert job, mapping out a near-perfect escape route, avoiding additional security cameras, and leaving little evidence behind. In fact, leaving behind only this footage. So far in my review of the tape, all I’d noticed was that he’d stopped to scratch a spot to the bottom left of his collar a couple of times before placing his hands on the cash box to steal it away. This spot really seemed to bother him for some reason. But by my seventeenth view or so of the footage, I noticed something different. If you blinked, you would have missed it. I watched it some more, and the more I watched the footage, the more clearly the gesture became somewhat of a clue to go on. The mystery man stopped, looked up toward the camera, and winked. He actually winked! It was kind of far away and not the clearest of footage, granted, but I also knew a wink when I saw one. Yes, admittedly, I sometimes tended to take my cases a bit too personally, since I was the one who tended to solve them, rather than law enforcement, but for some reason I felt as though that wink was directed right at me. Like he knew I was hot on his trail. This only made me want to solve the mystery even more. I mean, how could it not have been directed at me? I had been on the trail of this criminal for two days now, moving into a third. I wanted nothing more than to bring this whole string of criminal activity to a close. I hit rewind again and sat as close to the screen as I could without going cross-eyed. Mrs. Gruen—our housekeeper and a mother figure to me—would have yelled at me if she walked in and seen me. She loved to say that I would go blind if I sat too close to the television. I shrugged away her voice in my head, scolding me, and looked for the thief’s wink again. There it was—wink! I couldn’t tell you what color those eyes were, but one of them was definitely winking, as if to tell me he knew I was onto him. The wink was an acknowledgment that he was smarter than the police, smarter than me, and he wasn’t going to get caught. According to my PDA, the time was 7:42 a.m.—eighteen minutes before the rest of the carnival volunteers would begin to show up and set up their stations. I whipped around, half expecting the dark-hooded, ski-masked figure I’d been watching on the television monitor to be glaring back at me, maybe winking at me. Yesterday, Ned had been the first suspect in the theft of the cash box money. Just because he was working at the ticket booth and maybe . . . okay, definitely dozed off for a while, providing a moment for the thief to break into the booth and steal the cash box. So even though he didn’t steal the money, he had a certain amount of blame in the whole thing. Now don’t get me wrong, I’m still mad at Ned for falling asleep at the counter. I mean, who does that? I’m just thankful that I was there to help prove his innocence. Otherwise, Mark Steele, the head of the carnival committee, and Chief McGinnis would have most likely arrested him. People really had been treating this year’s annual River Heights’ Celebration differently. The reason? It seemed more important than years past—mostly, I assumed, due to Mrs. Mahoney’s involvement. Thanks to her generosity (and the money her late husband, Cornelius, left her in his will when he passed), everything was much more grand this year. The rides, the food—even the traditional Daughter of River Heights Celebration parade were all more extravagant than ever. Or at least, they were supposed to be. Sabotage had become the word of the hour throughout this celebration. The rides, the cash box, even the food had been sabotaged, with a grill fire and food poisoning. Mara Stanfield, the president of the Daughters of River Heights Association, had a brick with a nasty note thrown through her house window. The cash from ticket sales wasn’t just going back to Mrs. Mahoney for what she’d spent on the carnival. No—today, the last day of the celebration, would conclude with the first annual Mahoney Scholarship Award ceremony, where one student would receive a full scholarship to the college or university of their choice. The other candidates would get to split the money from the ticket sales. Maybe the answer to all this was buried in there somewhere. I lifted up my key chain and held it by one particular silver key, shaking it, and making it jangle. I couldn’t help but think that he was right on both counts, though—my coffee did taste like a caramel train wreck, and yesterday was crazy. In fact, the last two days had been oddly interconnected with crime, each day with more sabotage and threatening blue notes than the one before. And those black smudges at the edges of the blue notes added a whole other layer of confusion. It all started with Lexi Claremont, a client, who had hired me to infiltrate the it-girl clique, one of whom was my nemesis Deirdre Shannon, to figure out who had been writing a nasty blog about Lexi and sending her threatening messages. Thankfully, that mystery had been resolved well enough: Heather Harris, Lexi’s supposed BFF, had been keeping the blog. And yesterday the missing cash box money was the main event. First Ned, and then Mara Stanfield were accused, each tapped as the main suspect at different points in the day. It took awhile, but once I approached our town psychic (I know, I didn’t think it would work either! ), Lucia Gonsalvo, for assistance, she pointed me toward this video footage that not only proved Mara’s innocence, but showed that the notes and the serious sabotage were the handiwork of this winking, masked mastermind I’d been analyzing this morning. The once super-fun River Heights Celebration had been all but canceled this year because of the fires and theft and life-threatening parade sabotage. It had been a virtual nightmare, actually, but I was so much closer to finding the main culprit responsible for the bulk of the criminal activity. I couldn’t help but wonder if or how Mara was involved. She had been targeted to be framed, which was no coincidence, in my opinion. I rewound the tape again and watched the man in slow motion. He snuck into the ticket booth, completely disguised with a mask, then left, but not before winking. “Did you see that?” I asked Ned. “He winked,” Mara said, standing in the doorway behind us. Ned and I both jumped in our chairs. “Find anything new?” she asked. I was shocked at her gratitude and hoped my surprise didn’t show on my face. This woman never apologized, which only showed what a big deal her words were to me. “You’re welcome, Mrs. Stanfield.” I felt uncomfortable and changed the subject. “Lexi Claremont is presenting the Mahoney Scholarship Award tonight, right?” I asked. “Everything from the carnival to the scholarship is paid for by Mrs. Mahoney and the Mahoney Foundation. Her husband was Cornelius Mahoney, a local businessman,” I said. “How do you know all of this?” Mara asked. “Okay, enough for now. Get out of here, you two,” said Mara. Ned and I stood and left the front office of the school, leaving Mara behind. As we walked toward the front door I heard the machine rewind and the tape play back twice before we were outside. Mara stayed behind, watching the video footage just like I’d been doing since early that morning.